We have a great and unusual assortment of bulbs in now for fall planting that will make your yard ready to spring! Here are some tid-bits on how to have the springiest garden on the block. Fall planted bulbs spend the rest of the year and winter growing roots and preparing to grow leaves and blooms. Many come from mountainous regions of Europe and the near east that have a chilly winter and require the cold winter sleep to kick start the flowers. Plant bulbs pretty much anytime before spring. It’ll be easier to do so before the ground freezes, but even if you forget some bulbs, just wait til the snow is deep enough to thaw the ground and dig down to plant some as late as December or January. Be sure to cover them again completely with soil and snow to help insulate them. If you wait too long and they can’t get a long enough chill (like March or April) they may not bloom the current year, but they’ll at least grow some healthy roots and leaves that will make the bulb well-established for blooming in the coming years. 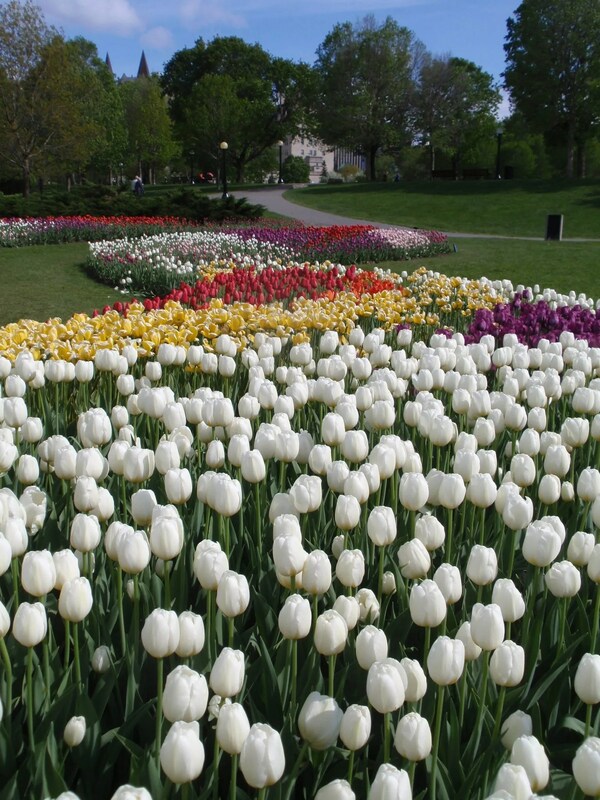 A general rule is to plant bulbs 3 x the height deep and about half to a whole bulbs width apart. If your soil is clay-heavy plant them a little shallower and if a little sandy plant a little deeper. Sprinkle some bloodmeal to help deter squirrels and an all-natural fertilizer (like Better World) into the hole and work it into the surrounding soil before putting the bulbs in. You can also keep squirrels at bay by planting allium bulbs with them (they smell garlicky) or putting the bulbs in a chicken wire cage in the ground. Pick an area of the garden that gets plenty of light and has good drainage. Covering the ground with a ~2 inch layer of mulch will help insulate the bulbs and keep in moisture over the winter as well as keep the weeds down come spring. Once the flowers bloom in spring, only remove the flowers (either to enjoy in a vase or once they’ve croaked) and leave any leaves on until they shrivel and turn brown. The leaves continue to photosynthesize and feed the bulb for the next year and you don’t want to rob them of their food. With these tips you’ll be turning your neighbours green with envy and your garden every other colour with glorious, rapturous blooms that will come back year after year. Come into the store now to check out all the amazing new flower varieties we have on offer!